Pencil pleat curtains have a soft informal look making them a popular choice for bedrooms or cottage interiors. Pencil pleat curtains work equally well on poles or tracks and by setting the heading tape down slightly (a maximum of 5 cm) an attractive ‘ruffle’ can be created at the top of the curtain. Tinsmiths pencil pleat curtains are calculated using at least twice the fullness to prevent the pleats becoming uneven over time. As a general rule we make our pencil pleat curtains using a 7.5 cm heading tape, however both 5 cm and 2.5 cm tapes can be used for short curtains – 2.5 cm can look really pretty on sill length cottage curtains with the tape set down 4 cm to provide softness at the top. 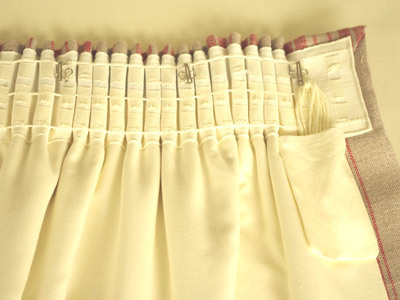 A 12.5 cm pencil pleat tape can be used on very long curtains. B. the length from the eye of the curtain ring or slider to where you would like the bottom of the curtain to be – ‘hook to hem’ measurement. C. the distance from the eye of the curtain ring or slider to where you would like the curtain top to be – ‘hook to top’ measurement. 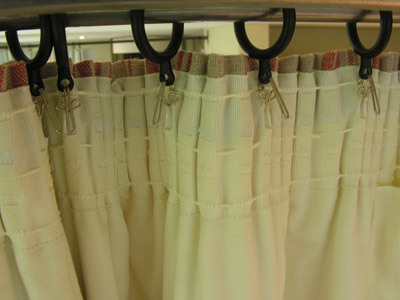 Pencil pleat curtains can be hung on tracks or poles. 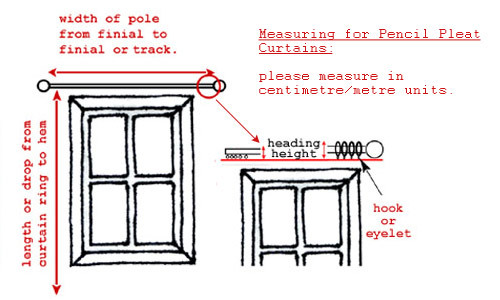 We would strongly advise that the curtain pole or track is in position before you measure for curtains. It is disappointing to have your curtains made up and then to realise that your pole cannot be fitted where you had planned. A dicey bit of wall, steel lintels etc can all make fitting the pole unpredictable. With pole in position when you measure, your curtains will then be properly ‘made to measure’. We would recommend that the pole be 30 – 44 cm wider than the window (15-22 cm either side). If space is limited on one or both sides ‘recess’ brackets may be a consideration; some of the curtain poles that we stock can be supplied with recess brackets, please enquire. We would suggest that the bottom of the pole is between 6 & 12 cm above the top of the window depending on the space available. Once you have your curtain poles in place then measure as instructed above. Measure your curtain pole/track divide your answer by 2 & add 10cm.Example: pole/track length is 160cm / 2 = 80cm, 80cm + 10cm = 90cm. Your curtains will have the tape strings loose on one side. Pull these to gather up the heading until you reach the required width. In the case of the example above you would want the curtain to be 90cm when gathered up. When you have reached the required width secure the strings with a slip knot or a knot which you are confident that you can undo (curtains are much easier to clean, move or store in their flat state), then tuck the spare string into the little bag just beneath the tape. Even out the pleats across the width of the curtain & then put the hooks provided into the heading tape – 1 hook per 10cm (4″) is a rough guide starting 5cm (2″) approx from each side. 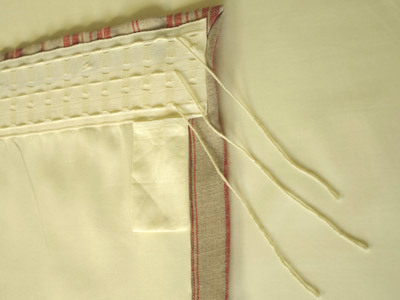 We generally advise that you put the hooks into the top pocket but with 7.5cm (3”) tape the other pockets can be used if preferred or if the curtains hang a smidge long. I want to thank you for my beautiful curtains - they are exquisitely made and make such a difference to our bedroom!